Bloodbonded launched successfully on July 1. Yay! And that’s about all that’s happened. It’s sold a few copies. My plans to market and promote more diligently went awry. I should never make plans to work in the summer. I never manage to see them through. But the book is out there, anyway, and that’s progress. There’s a bit of news on the Ravenmarked front, too. First, I have finally finished the print version. It’s now available on Amazon for $13.99. 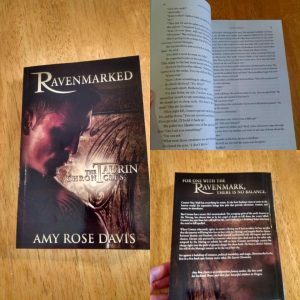 Proof of life–Ravenmarked in actual print form! Second, back in March I entered Ravenmarked into Mark Lawrence’s Self-Published Fantasy Blog-Off (a.k.a. SPFBO). The book was one of 30 titles assigned to the friendly folks at Fantasy-Faction. On August 11, I found out that Ravenmarked made it to the top seven! There are about 300 books in the contest overall–about 30 assigned to each of ten book bloggers and review sites. After each site chooses its winner, the top ten books will be evaluated for the top spot of the 300 books entered. I don’t really think Ravenmarked has much chance at that top spot, but it’s pretty cool to at least make it this far. It’s some good reassurance that I’m not just a hack with limited to no appeal in a broader market. In other writing news… I had hoped to get some time to edit the first novel of the dragon western series into something fit for public consumption this summer, but alas, that is not going to happen. Here’s hoping I can find the time to tackle it in September, but I am going to be rebuilding my freelance commercial business, so fiction will have to take a backseat to that. Again. I know I’ve said before that I’m going to rebuild that business, but this time, it’s really true. When I tried to rebuild it before, I was still overwhelmingly busy with my volunteer position. I’ve now resigned from that job, so that should free up considerable time to look for freelance work again. We had some expenses come up that we need a little boost to help cover. We have some more coming down the road. There are goals to meet and kids to help out and futures to consider. So… I’m going to be a grown-up and do the responsible thing and go back to writing for businesses. I’m not giving up on fiction, though. For one thing, it’ll take time to find clients and projects again (although I do have one starting soon, so that’s cool). While I’m drumming up work, I’ll have some time to work on the fiction. But more importantly, I’m not so foolish as to think that I can suppress the fiction monster for any length of time longer than my kids’ summer break. I’ve learned my lesson. I can’t ignore the characters too long or I get twitchy. When I get twitchy, everyone around me suffers. For the good of my friends and family, I have to let off the creative energy somewhere. It’s either yarn or writing. Yarn happens when I have people around me. Writing happens when I have quiet time. Both are necessary for my sanity and my family’s health. School starts the day after Labor Day here. I don’t expect I’ll be around much till then. I hope you’re all having a lovely summer doing all the best things. Good to hear that everything’s ok and you’re just busy. Absent the sore body, I hope you enjoyed the camping! Congrats on the Blog-Off, and good luck with that going forward. 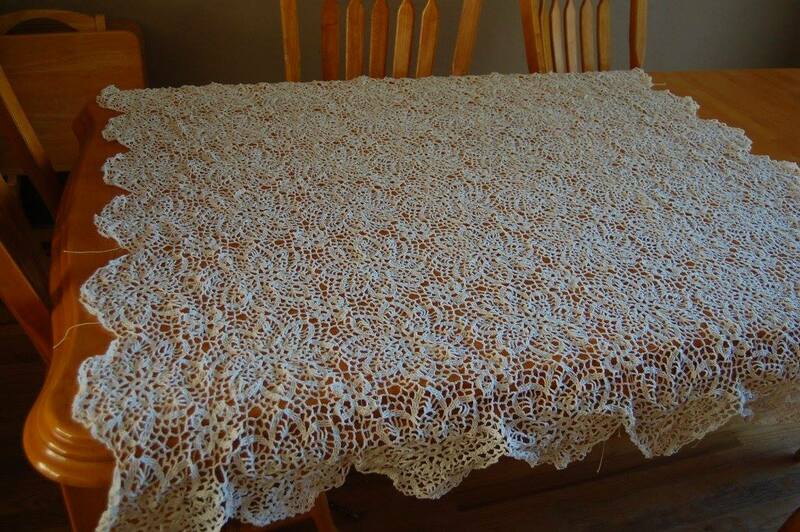 I don’t know if I could ever eat a meal, even Christmas, Easter or wedding feast, on that table cloth. Even short, it looks lovely. I didn’t know book two was out!!! But I have been busy with wedding plans. I’m picking it up asap, I do hope you continue writing, I really enjoyed the first! 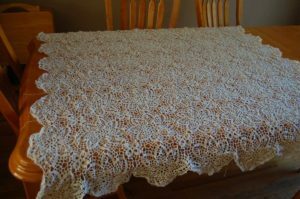 Wedding plans–how exciting!! I hope that’s going well for you! Congratulations! And I do hope you enjoy Bloodbonded as well. Don’t worry–I will keep writing. My brain keeps churning the stories, so I’ll keep putting them down. Thanks for the kind words!